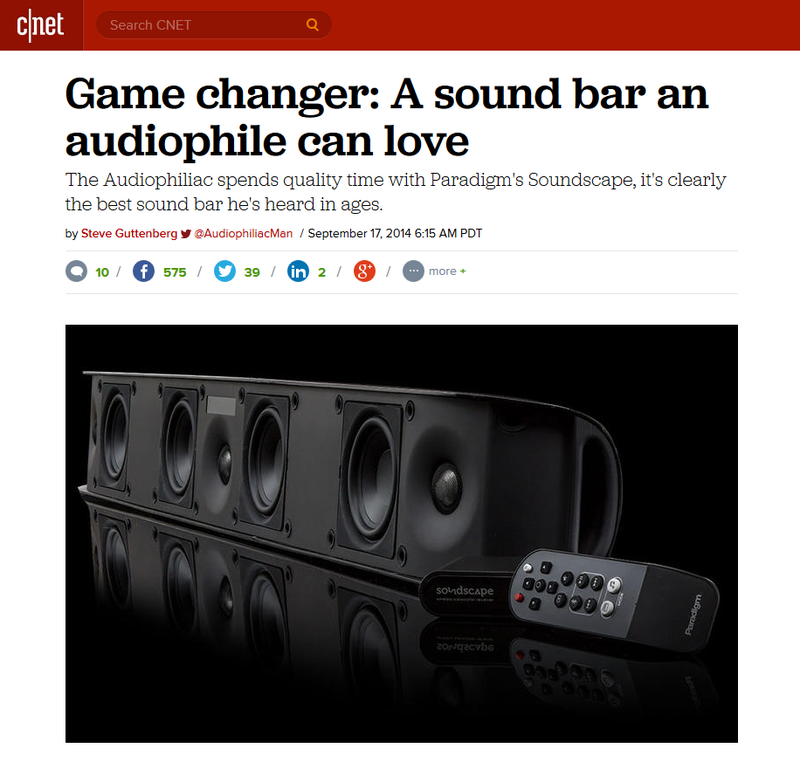 "The Audiophiliac spends quality time with Paradigm's Soundscape, it's clearly the best sound bar he's heard in ages." It's really hard not to be excited when you read a headline and sub-headline like the above... Especially when it is regarding our very own Paradigm Soundscape 5.1 soundbar. Below are some quotes from CNET audio journalist, Steve Guttenberg. "It came as a total surprise to me, but when the Paradigm Soundscape sound bar appeared in the CNET office I thought why not give it a spin? Unpacking the super solid 'bar it was easy to see Paradigm's build quality shames the more typical plastic or lightweight wood sound bars, the Soundscape metal clad, 20-pound, 5.5 by 42 by 5 inch cabinet looks sleek." "The Soundscape is significantly more powerful than any other subwooferless sound bar, and clarity and dynamic punch were superb... man, this sound bar is a force to be reckoned with! Whether it was Kong wrestling with dinosaurs or space station hijinks, the Soundscape's dynamic punch easily KO-ed what passes for merely excellent everyday high-performance sound bars..."
"...most folks prefer a single speaker, easier-to-setup solution. So for them the Soundscape is highly recommended." Click here! to read the full Soundscape review from CNET. Click here! for more info on the Soundscape or to buy online.